India’s Polar Satellite Launch Vehicle made its 23rd flight on Monday, carrying seven satellites into sun-synchronous orbit including Austria’s first satellite. Liftoff from the Satish Dhawan Space Centre was marked at 12:31 UTC (18:01 local time). The primary payload for Monday’s launch was the 409-kilogram (902-pound) Satellite with ARGOS and AltiKa, or SARAL, which will be operated jointly by ISRO and the French space agency CNES. The spacecraft was built by ISRO around a bus designated the Minisatellite-SSB, Small Satellite Bus 1 (SSB-1) or IMS-2. Its instruments were built by CNES. SARAL is equipped with the AltiKa radio altimeter and ARGOS-3 which will collect and relay data from remote observation posts and buoys. Two orbit determination systems are also aboard the satellite; Doppler Orbitography and Radio positioning Integrated by Satellite (DORIS) uses Doppler shifts in radio signals to monitor the satellite’s orbit, while a Laser Retroreflector Array (LRA) can be used to measure the distance from the ground by bouncing lasers off the satellite. SARAL’s primary objective is to study the seas and oceans, in order to produce a more accurate model of surface topography and altitude. Its results are expected to compliment those of the Ocean Surface Topography Mission, being undertaken by the Jason-2 satellite launched in June 2008. It will also replace the oceanography functions of the Envisat spacecraft, which failed last April after ten years in orbit; more than twice its design life. SARAL is expected to operate for three years. Three Canadian spacecraft were carried as secondary payloads. Sapphire is a 148-kilogram (326 lb) space surveillance satellite developed by MDA Corporation for Canada’s Department of National Defence. The satellite was constructed in the United Kingdom by Surrey Satellite Technology Ltd, based around the SSTL-150 bus. It will conduct electro-optical observations of objects in Earth orbit with a 15-centimetre (6-inch), providing data for NORAD which will be used as part of the Satellite Catalog. Data will also be provided to the United States’ Space Surveillance Network. The second Canadian satellite is NEOSSat, or Near Earth Object Surveillance Satellite, which will be operated by the Canadian Space Agency. Like Sapphire, it carries a 15-centimetre telescope; however it will be used primarily to look for asteroids. It uses the Multi-Mission Microsatellite Bus, and was built by Canadian firm Microsatellite Systems. The satellite has a mass of 74 kilograms (163 lb). The University of Toronto has arranged for the launch to carry three small satellites for universities as part of its Nanosatellite Launch Services programme, designated NLS-8; UniBRITE, TUGSAT-1, and AAUSAT3. UniBRITE and TUGSAT-1 are part of the Bright-star Target Explorer (BRITE) programme, a joint effort between Canada, Austria and Poland, with TUGSAT-1, the Austrian component, being that country’s first satellite. UniBRITE is one of the Canadian contributions to the programme. 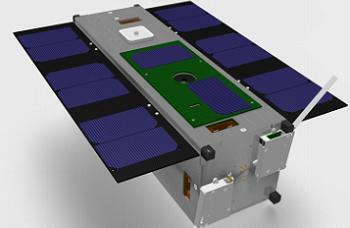 UniBRITE and TUGSAT-1 are both 14 kilogram spacecraft constructed by the University of Toronto, based on the Generic Nanosatellite Bus (GNB). They will be joined in the BRITE constellation by Poland’s Lem and BRITE-PL2 satellites, and Canada’s BRITE-CA1 and BRITE-CA2, which will all be launched at later dates. The programme is aimed at studying variations in the brightness of stars. UniBRITE is also known as CanX-3A and TUGSAT as BRITE-Austria. 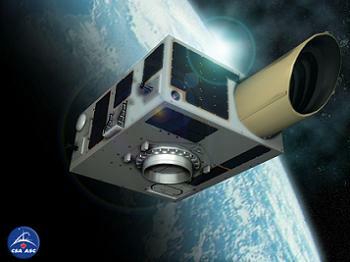 The third NLS payload was AAUSAT-3, a single-unit CubeSat for Aalborg University of Denmark. The third AAUSAT launched, it follows on from AAU-CubeSat 1, launched by a Rokot in 2003, and AAUSAT-2 which flew on a PSLV in April 2008. The satellite will be used to test AIS and GPS receivers in orbit. It has a mass of 3 kilograms (7 lb). 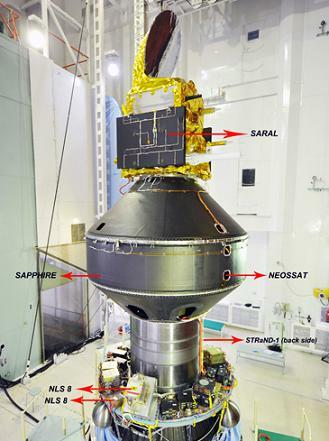 The seventh and final satellite aboard the PSLV was the British STRaND-1 spacecraft. Part of the Surrey Training Research and Nanosatellite Development programme, it is a three-unit CubeSat which was built and will be operated by SSTL. The satellite will be used to test an Android-based smartphone in space, and to determine whether the phone can be used to control the satellite if its onboard computer is deactivated. The Polar Satellite Launch Vehicle, or PSLV, is India’s most-flown carrier rocket. Operated by the Indian Space Research Organisation, ISRO, it is a 230-tonne (226-imperial ton) four-stage rocket which measures 44.4 metres (145.7 feet) in length. The PSLV used for Monday’s launch had the serial number C20 and flew in the Core Alone, or PSLV-CA, configuration. The PSLV-CA configuration consists of the core PSLV vehicle but without the strap-on solid rocket motors typically used to augment the first stage’s thrust at liftoff. The first stage, designated PS1 or S139, is 20 metres (66 feet) long and fuelled by a hydroxyl-terminated polybutadiene-based solid propellant. The stage also uses vernier engines for roll control, which will ignite three seconds before the countdown clocks reach zero. At T-0, the PS1 ignited and PSLV C20 began its ascent towards orbit. The PS1 burned for 113.14 seconds before it was jettisoned at an altitude of 52 kilometres (32 miles). Two tenths of a second after separation, the second stage, designated PS2 or PL40, ignited. This is a 12.8 metre (42 foot) liquid-fuelled stage, propelled by a Vikas engine which burns 75 percent unsymmetrical dimethylhydrazine and 25 percent hydrazine hydrate as propellant and dinitrogen tetroxide as an oxidiser. The second stage burned for 151.7 seconds, propelling the rocket to an altitude of 222 km (138 miles) and an inertial velocity of 3.6 kilometres per second (8050 mph). Around 64.7 seconds into the second stage burn, the payload fairing; termed a “heat shield” by ISRO; separated from around the spacecraft. Following second stage burnout and separation at 265.04 seconds after launch, the third stage, an HPS3, ignited. This stage is 3.6 metres (11.6 feet) long, and like the first stage it is fuelled by an HTPB-based solid propellant. Ignition took place 1.2 seconds after stage separation, and the stage burned for around 110 seconds, after which the vehicle coasted for approximately three minutes. Eight minutes and 40.04 seconds after launch, the third and fourth stages of the PSLV separated, and just short of 11 seconds later, the fourth stage fired. This stage is a PS4, also known as an L2.5; it is 2 metres (7 feet) in length and fuelled by monomethyl hydrazine, oxidised by mixed oxides of nitrogen containing 3 percent nitric oxide. The stage burned for eight minutes and 29.72 seconds before shutting down to complete PSLV C20’s powered flight. The target orbit for PSLV C20 is one with a semi-major axis of 7163.393 kilometres (4451.126 miles) resulting in an altitude of 785 kilometres (488 miles); at an inclination of 98.536 degrees to the equator. At the end of powered flight the upper stage yawed to an orientation 20 degrees off the axis of flight, and thirty seven seconds later, SARAL separated from the carrier rocket. The upper stage then performed another yaw manoeuvre, to five degrees off-axis in the opposite direction, and jettisoned the upper portion of the Dual Launch Adaptor, or DLA-U, atop which SARAL was mounted. This separation will occurred 30 seconds after SARAL separated. The fourth stage then yawed a further 20 degrees in the same direction, and 30 seconds after the adaptor separated, Sapphire was deployed. NEOSSat separated 25 seconds later, the rocket first having yawed another 10 degrees off the line of flight. Both of these satellites were located underneath the Dual Launch Adaptor, and separated by use of IBL-298 mechanisms. After NEOSSat separates, the upper stage then yawed through a further 48 degrees away from the axis of flight, and rolled 40 degrees. AAUSAT then separated fifty seconds after NEOSSat, and its separation was followed by another 40 degrees of yaw. TUGSAT-1 separated 40 seconds after AAUSAT-2, followed 20 seconds later by UniBRITE. Between these two separation events, the upper stage performed a 20 degree roll manoeuvre. The three NLS satellites used the XPOD separation mechanisms for deployment, and were attached to the sides of the fourth stage; AAUSAT and TUGSAT on one side, and UniBRITE on the other. Following the separation of UniBRITE, the rocket added a further ten degrees of yaw, and roll through 30. The final payload, STRaND-1, separated 30 seconds after UniBRITE, using an ISIPOD deployment system. It was mounted on the same side of the fourth stage as UniBRITE. Once all payloads separated, the fourth stage yawed a further 60 degrees in the same direction, and passivation began 430 seconds after powered flight ended. Monday’s launch was the twenty-third flight of the PSLV, which first flew in 1993. 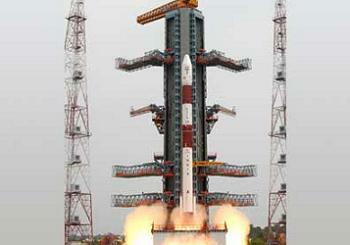 It was the ninth flight in the PSLV-CA configuration, and the 20th operational PSLV launch. Of its 22 flights before C20, the PSLV has achieved 20 successful launches, with one failure and one partial failure. It has achieved 18 consecutive successful launches since its last problem; a partial failure during the launch of IRS-1D when a fourth stage helium leak led to a lower than planned orbit being reached. Although the satellite was able to correct its orbit, it used a considerable amount of its fuel reserves in doing so. The PSLV’s other failure occurred on its maiden flight, which failed to achieve orbit after the vehicle lost attitude control. PSLV C20 launched from the Satish Dhawan Space Centre, which has been used for all of India’s orbital launches. Monday’s launch used the First Launch Pad, the older of two operational launch complexes at the site. 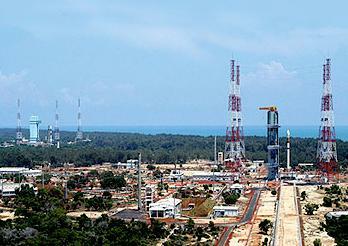 The launch of SARAL marked India’s first orbital launch of 2013. Three further launches are currently planned, the next of which is expected in May when the Geosynchronous Satellite Launch Vehicle will return to flight carrying the GSAT-14 satellite. That launch is important for India due to the GSLV’s reliability problems, having achieved only two successes from seven launches, with the last four launches resulting in three failures and a partial failure. During the third quarter, ISRO is expected to orbit the IRNSS-1 navigation satellite, and the launch of India’s first mission to Mars, Mangalyaan, is scheduled for 25 October. Both of these launches will use PSLVs.